Lenovo might have just become the largest PC maker at the end of this year surpassing HP, but the company is also making tablets and it brought its lineup to Mobile World Congress. The Lenovo A3000 is one of them, an affordable tablet with a 7-inch 1,024x600-pixel IPS screen and 1.2GHz quad-core MediaTek processor. The IPS screen is a definite advantage the A3000 has over its more affordable A1000 sibling - the screen has wider viewing angles making for a much more pleasant viewing. The device is a bit thicker than your usual tablet at 11mm (0.43 inches), but nothing too thick. 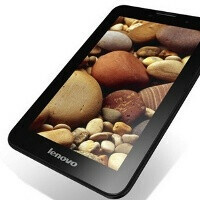 The Lenovo A3000 runs on Android 4.1 Jelly Bean as all other newly announced Lenovo tablets. It features expandable storage supporting microSD cards of up to 64GB. Good news is those tablets will arrive globally in Q2 and will also be available in the United States.